Monash Department of Clinical Epidemiology, Cabrini Institute and Department of Epidemiology and Preventive Medicine, School of Public Health and Preventive Medicine, Monash University; School of Public Health and Preventive Medicine, Monash University, Melbourne; Department of Rheumatology, Royal Prince Alfred Hospital; Sydney Medical School, University of Sydney, Sydney, Australia; School of Social and Community Medicine, University of Bristol, Bristol; Arthritis Research UK Primary Care Centre, Research Institute for Primary Care and Health Sciences, Keele University, Staffordshire, UK; Department of Orthopedic Surgery, and Department of Epidemiology, School of Public Health, University of Michigan, Ann Arbor, Michigan; Department of Physical Medicine and Rehabilitation, Vanderbilt University Medical Center, Nashville, Tennessee, USA; Department of General Practice, Erasmus Medical Centre University, Rotterdam; Department of Psychology, Health and Technology, University of Twente, Enschede, the Netherlands; St. Michael’s Hospital, Musculoskeletal Health and Outcomes Research, The Li Ka Shing Knowledge Institute, composed of the Keenan Research Center and the Li Ka Shing International Healthcare Education Center of St. Michael’s Hospital; Institute for Work and Health, Toronto, Ontario, Canada; University Hospital Carl Gustav Carus Dresden, Center for Evidence-Based Healthcare, Dresden, Germany; Hospital Israelita Albert Einstein, Sao Paulo, Brazil. Objective. The Outcome Measures in Rheumatology (OMERACT) Shoulder Core Outcome Set Special Interest Group (SIG) was established to develop a core outcome set (COS) for clinical trials of shoulder disorders. Methods. In preparation for OMERACT 2016, we systematically examined all outcome domains and measurement instruments reported in 409 randomized trials of interventions for shoulder disorders published between 1954 and 2015. Informed by these data, we conducted an international Delphi consensus study including shoulder trial experts, clinicians, and patients to identify key domains that should be included in a shoulder disorder COS. Findings were discussed at a stakeholder premeeting of OMERACT. At OMERACT 2016, we sought consensus on a preliminary core domain set and input into next steps. Results. There were 13 and 15 participants at the premeeting and the OMERACT 2016 SIG meeting, respectively (9 attended both meetings). Consensus was reached on a preliminary core domain set consisting of an inner core of 4 domains: pain, physical function/activity, global perceived effect, and adverse events including death. 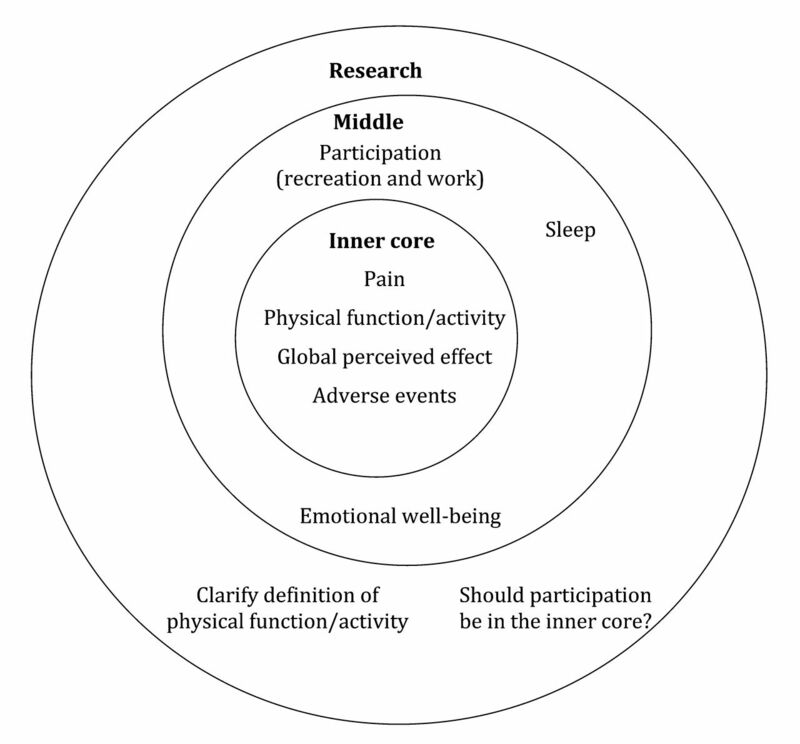 A middle core consisted of 3 domains: emotional well-being, sleep, and participation (recreation and work). An outer core of research required to inform the final COS was also formulated. Conclusion. Our next steps are to (1) analyze whether participation (recreation and work) should be in the inner core, (2) conduct a third Delphi round to finalize definitions and wording of domains and reach final endorsement for the domains, and (3) determine which instruments fulfill the OMERACT criteria for measuring each domain. There has been exponential growth in the numbers of published trials evaluating interventions for shoulder disorders, but a lack of uniformity in measured outcomes across trials limits our ability to compare findings between studies and synthesize data in metaanalyses (e.g., Page, et al’s study1). A systematic examination of outcomes reported in 171 trials investigating physical therapies for adhesive capsulitis or rotator cuff disease found that the median number of outcome domains reported was 3 (range 1–6). Pain (87%), function (72%), and range of motion (ROM; 67%) were most commonly reported, while adverse events (27%), patient-reported treatment success (24%), strength (18%), health-related quality of life (HRQOL; 18%), and work disability (4%) were reported in a minority1. To reduce heterogeneity in outcomes measured across clinical trials, the development of core outcome sets (COS) in specific health conditions has been recommended2. A COS is defined as an agreed minimum selection of outcomes that should be measured and reported in all clinical trials for a particular health condition3. It guides and reinforces reporting of important outcomes, reduces risk of selective outcome reporting, and increases the feasibility of conducting metaanalyses. The Outcome Measures in Rheumatology (OMERACT) Shoulder Core Outcome Set Special Interest Group (SIG) was established to develop a COS for clinical trials of shoulder disorders4. Our paper outlines our preliminary work and outcomes of a pre-OMERACT meeting and SIG meeting at OMERACT 2016 that aimed to reach consensus on a preliminary core domain set and identify a research agenda to support the development of the COS. Consensus was reached on a preliminary core domain set consisting of an inner core of 4 domains: pain, physical function/activity, global perceived effect, and adverse events including death; a middle core consisting of emotional well-being, sleep, and participation (recreation and work); and an outer core of research required to inform the final COS. To our knowledge, no COS for shoulder trials currently exists. Development of the COS will markedly improve the standardization of outcome measurement across these trials, thereby enhancing our ability to compare findings from different studies and pool data in metaanalyses. In line with OMERACT recommendations5, we formed a multinational, multidisciplinary Steering Committee consisting of 3 leads (RB, AV, JG), 2 OMERACT fellows (MP, HH), an OMERACT liaison (DB), and 2 patient representatives (PR and MV); and a multinational (Australia, Brazil, Canada, the Netherlands, Germany, United Kingdom, and United States) and multidisciplinary (epidemiology, occupational therapy, orthopedic surgery, physical medicine and rehabilitation, physiotherapy, primary care, and rheumatology) Working Group consisting of researchers and clinicians with expertise in shoulder disorders, consensus-based research procedures, and measurement. Prior to OMERACT 2016, we performed 2 studies. First, we systematically examined outcome domains and measurement instruments reported in randomized trials of interventions for shoulder disorders (including rotator cuff disease, e.g., tendinopathy, impingement, subacromial bursitis, and tears), adhesive capsulitis, instability, glenohumeral osteoarthritis (OA), dislocation, proximal humeral or humeral head fractures, or unspecified shoulder pain published between 1954 and 20156. We identified 409 trials reporting outcomes across 41 domains and 319 instruments. The most commonly reported outcome domains were pain (90%), ROM (78%), and physical function (71%). Adverse events were more frequently measured in dislocation/fracture trials (77% vs 20–31% for all other trials) and radiographic outcomes were measured more frequently in trials of people with shoulder OA (56%) or dislocation/fracture (50%; vs 1%–29% for all other trials), while strength was measured less frequently in trials of people with adhesive capsulitis (21%) or unspecified shoulder pain (23%; vs 44–63% for all other trials). Second, we conducted an international Delphi consensus study including 55 shoulder trial experts and/or clinicians and 41 patients from 13 countries to identify the key domains that should be included in a shoulder COS7. Four domains met an a priori threshold (at least 67% of all respondents) for inclusion in the core set: pain, physical functioning, global assessment of treatment success, and HRQOL. Two additional domains, sleep functioning and psychological functioning, met the threshold for inclusion by some but not all (35% clinician/researchers unsure or preferred to exclude sleep functioning; 27% patients unsure or preferred to exclude psychological functioning). There was consensus that number of deaths was not a core domain while no consensus could be reached for ROM and muscle strength. It was noted that there were distinct differences in responses in the Delphi study between groups. While patients tended to rate almost all domains highly, researchers were less likely to consider measurements such as ROM, strength, and radiographic outcomes as important as other domains. The results of these 2 preparatory projects were presented and discussed at a half-day meeting of the Steering and Working Groups held the morning before OMERACT 2016 to optimize integration with the OMERACT process. Pre-reading included the protocol for development of the shoulder trial COS and results of the review of outcomes and Delphi studies. At this meeting, we sought endorsement of our PICO [definitions of the patients/population (P), interventions (I), comparator/controls (C), and outcomes (O)], consensus on a preliminary core domain set to present to the OMERACT SIG meeting, and identified priorities for further research. In line with OMERACT guidance5, we considered domains for the inner and middle core in the OMERACT onion format, and questions related to outcome measures that need to be addressed in future research were considered for the outer core. At OMERACT 2016, we convened a 1.5-h meeting open to all registered OMERACT participants. All participants received a pre-OMERACT report outlining the results of the preparatory projects. At this meeting, we presented the background and rationale for the establishment of our group, our PICO and results of the 2 preparatory projects, and the preliminary core domain set endorsed at the pre-OMERACT meeting. Participants were invited to provide feedback on the preliminary core domain set and offer alternatives to the domains or the domain names. We also sought input on a research agenda. At the end of the meeting, participants were asked to vote on the final preliminary core domains and their position in inner, middle, and outer rings of the OMERACT onion. We considered that an acceptable level of endorsement would be at least 70% for each domain. There were 13 participants at the pre-OMERACT meeting: 3 rheumatologists, 2 orthopedic shoulder surgeons, 1 family doctor, 1 physical therapist, 3 epidemiologists, an occupational therapist, and 2 patient representatives. There were 15 participants at the OMERACT SIG: 6 rheumatologists, 1 family doctor, 5 epidemiologists, an occupational therapist, and 2 patient representatives. There were 9 participants who attended both meetings. At both the pre-OMERACT and OMERACT meetings, there was 100% endorsement that the COS should be applicable to shoulder disorders of any duration that included rotator cuff disease (e.g., tendinopathy, impingement, subacromial bursitis, and tears), adhesive capsulitis, instability, glenohumeral OA, dislocation, proximal humeral or humeral head fractures, and unspecified shoulder pain. The primary aim of the COS would be for trials of interventions (e.g., prevention, treatment) compared with placebo, no treatment, or other active interventions where the outcome(s) of interest are clinical (i.e., not diagnostic accuracy of tests), although the COS may be applicable as well to observational studies (e.g., describing effect or prognosis of shoulder conditions). At the pre-OMERACT meeting, participants agreed with the inclusion of pain and physical functioning as inner core domains (100% endorsement), in keeping with their endorsement by the Delphi study7. Global assessment of treatment success also endorsed by the Delphi study was also included in the inner core (100% endorsement), but changed to “global perceived effect” because some trials include a usual care or no treatment arm where treatment success may not be a relevant concept. HRQOL, endorsed by the Delphi study, was not endorsed for inclusion as an inner core domain because several of its subdomains (pain interference, and physical and psychological functioning) were already identified within other domains. Participants unanimously voted for a fourth inner core domain: adverse events. “Deaths,” expected to be rare for shoulder disorders, was not endorsed as a separate domain, in keeping with the Delphi study, but it was acknowledged that it should be reported if it occurs within the domain of adverse events. Adverse events were considered distinct from unfavorable outcomes related to the other core domains. For example, an increase in pain would not be recorded as an adverse event given it is already covered by the pain domain. A fracture non-union would be an adverse event. While there was discussion about whether subdomains of physical function, such as activities of daily living (e.g., bathing, dressing), work, sports, and recreational activities, should be defined explicitly, this was not resolved. It was noted that while the ability to perform activities of daily living might be important for all shoulder disorders, ability to return to sports activities might not be equally relevant across all patients or trials. Sleep functioning was endorsed (100%) as a middle core domain because while important, it was considered a consequence of pain. Psychological functioning was also endorsed (100%) as a middle core domain. Neither reduced range of movement nor strength was considered a core domain. The patient participants suggested that patient respondents in the Delphi study7 were likely considering the effect that reduced range of movement and strength have on function when indicating their importance in a COS. Although OMERACT recommends inclusion of resource use as a core domain, it was noted that it was not rated highly in the Delphi study7 and may not be relevant to all trials. There were also no pathophysiological manifestations included in our preliminary core domain set, another OMERACT core area. While important pathophysiological manifestations are measurable for some shoulder conditions such as fractures (fracture healing), participants noted the absence of reliable pathophysiological manifestations for all shoulder disorders. Possibilities for addressing this would be to still require a domain in this core area, but not specify it further or simply to recommend that trial designers consider whether a pathophysiological manifestation is important for their trial, for example, it would be important for a fracture trial. We will consider whether it is necessary to define relevant subgroups that should include a pathophysiological manifestation prior to finalizing the core set of domains. Participants at the OMERACT SIG meeting recommended several changes to the OMERACT onion. For the inner core, physical functioning was altered to “physical function/activity.” For the middle core, “psychological functioning” was changed to “emotional well-being” because it was considered to more clearly convey the intended concept, and “sleep functioning” was changed to “sleep.” Further work was considered necessary to define the physical function/activity and emotional well-being domains. There was also consensus for removing work and recreation/leisure activities from physical function to a new domain: participation (recreation and work). While patient representatives suggested locating this domain in the inner core, after discussion it was agreed that further research was needed before it could be considered for the inner core set, and it was therefore placed in the middle core. There was wide support for explicitly including death as part of the adverse events domain rather than a domain in its own right. It was also considered worthwhile to perform a review of qualitative studies that had analyzed the lived experience of having shoulder pain to ensure that all relevant domains have been considered. Figure 1 presents the final preliminary core domain set — each domain and its location in the OMERACT onion received 100% endorsement by SIG participants. Table 1 provides the current definitions for each domain7. Final proposed preliminary core domain set for trials in people with shoulder disorders at OMERACT 2016. Shoulder disorders include rotator cuff disease (e.g., tendinopathy, impingement, subacromial bursitis, and tears), adhesive capsulitis, instability, glenohumeral osteoarthritis, dislocation, proximal humeral or humeral head fractures, or unspecified shoulder pain. Definitions of a proposed preliminary core domain set for trials of people with shoulder disorders. There was unanimous agreement at the 2016 OMERACT Shoulder Core Outcome Set SIG meeting that the preliminary core domain set for shoulder disorder trials consist of an inner core of pain, physical function/activity, global perceived effect, and adverse events including death; a middle core of emotional well-being, sleep, and participation (recreation and work); and an outer core of research required to inform the final COS.
Our next steps will be to (1) analyze whether participation (recreation and work) should be in the inner core, (2) perform a review of qualitative studies that had analyzed the lived experience of having shoulder pain, (3) conduct a third Delphi round to finalize definitions and wording of domains and reach final endorsement for the domains from Delphi participants, and (4) determine which instruments can be endorsed after having passed the OMERACT 2.0 Truth Discrimination and Feasibility filter7. Results of this work will inform the final COS, which we plan to present to OMERACT for endorsement. We gratefully acknowledge the participation and insights of Outcome Measures in Rheumatology 2016 attendees at our special interest group session. A Patient-Centered Outcomes Research Institute (PCORI) Engagement Award supported this work (#2072). RB is supported by an Australian National Health and Medical Research Council (NHMRC) Senior Principal Research Fellowship (#1082138). MJP is supported by an Australian NHMRC Early Career Fellowship (#1088535). NJ is supported by funding from National Institute of Arthritis and Musculoskeletal and Skin Diseases 1K23AR059199 and 1U34AR069201. Accepted for publication December 9, 2016. Core domain and outcome measurement sets for shoulder pain trials are needed: systematic review of physical therapy trials. J Clin Epidemiol 2015;68:1270–81.
. Standardising outcomes for clinical trials and systematic reviews. Trials 2007;8:39. Developing core outcome sets for clinical trials: issues to consider. Trials 2012;13:132.
. Creation of a core outcome set for clinical trials of people with shoulder pain: a protocol. Trials 2016; Submitted. How to choose core outcome measurement sets for clinical trials: OMERACT 11 approves filter 2.0. J Rheumatol 2014;41:1025–30.
. Outcome reporting in randomised trials for shoulder conditions: literature review to inform the development of a core outcome set. Arthritis Care Res 29 Nov 2016; submitted.
. Identifying a core set of outcome domains to measure in clinical trials for shoulder pain: a modified Delphi study. RMD Open 28 Nov 2016; accepted.